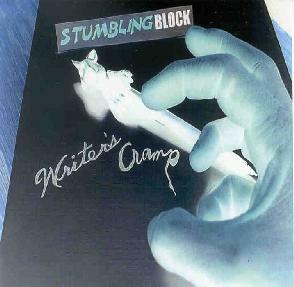 Stumbling Block - "Writer's Cramp"
-The music on the CD is created from microphone samples of John Lauer's voice. Stumbling Block is apparently an assumed alias of John Lauer. It did not take me much time to become worn with the direction of Writer's Cramp. John Lauer calls the material on this CD, "Experimental." Before commenting any further, I would like to say that I am not art's divine messenger sent down from above. Keeping this in mind, it sincerely felt like I had tuned into an Avant-garde oldies station when listening to the Writer's Cramp disc: K-Garde 101 FM. Allow one's self to progress from the state that the masters left behind. Computer Generated Music of the early 1960s was a great conceptual idea but not necessarily much to listen to. This CD contains sounds thrown into a blender with a slight quirkiness throughout. Essentially, Writer's Cramp reinvents the wheel without much else to offer. For more information you can email Stumbling Block at: jrlauer@msn.com. Musical Fruit Productions; PO Box 50138; Long Beach, CA 90815.